Corvallis, Oregon (March 25, 2019)--For mason bees, the wait for their first meal is a long one, nine months or more while they wait for the day to emerge, sun themselves a bit and fly off for an awaited meal. There�s no TV, no smartphone, not even a book to while away the time as these solitary bees hang out in their tight cocoons waiting for the cool temperatures of early spring to break them out of lethargy. And because honeybees and other pollinators haven�t made an appearance yet, there�s more sweetness for the native mason bees. After emerging in March, the small, bluish bees start foraging for food for the next generation and combing for suitable nesting sites. �They�re solitary, non-aggressive bees, so they�re very different from honeybees; they don�t form hives,� said Edmunds, author of the OSU Extension publication Nurturing Mason Bees in Your Backyard in Western Oregon. 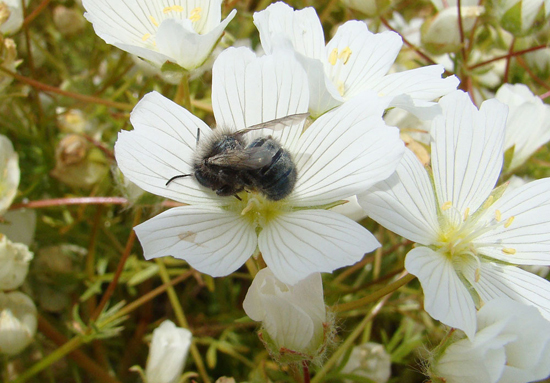 Instead, mason bees, most commonly the native blue orchard mason bee (Osmia lignaria), look for cracks and crevices that fit their need for small spaces where they crawl in and lay eggs. They might find the appropriate spots in wood bored by other insects, siding on buildings or nesting blocks filled with tubes containing cocoons. Gardeners can purchase tubes of cocoons containing adult bees. Keep them in the refrigerator until the weather is appropriate and sufficient food is available. Keep an eye out on the forecast and wait for a dry period and three days of temperatures between 50 and 55 degrees before placing them outside. Also, be aware of what�s blooming, starting with willow and big leaf maple, followed by other early-bloomers like fruit trees. Since the bees need a continuous source of food make sure there will be something blooming throughout their three-month lifespan. You can get elaborate and remove the cocoons each fall, clean them of frass and mites, store them in the refrigerator over winter and reinsert them in the tubes in spring. Or choose the easy way: Hang the tubes and wait for the bees to find them and lay their eggs. Or you can buy new cocoons each year. Instructions for each method are included in Edmunds� guide. For protection against predators, keep loose cocoons in a small cardboard box or tube with a hole just big enough for the bees to fit through. Then, gently place the container in the �attic� portion of the nesting house, which is the open area above the nesting block. Hang the nest box out in the yard, preferably in morning sun under an eave so that it�s sheltered from rain and wind. The mason bee�s preferred food comes from early-blooming fruit trees like apples, pears, plums and cherries. So, plant one or two to attract them to your garden to pollinate other plants. If you�ve got a small lot, choose columnar or dwarf cultivars. Though not as dear to the bee�s palate, other plants also attract them. Look to crabapples, flowering currant, elderberry, huckleberry, forsythia, Pieris and Oregon grape. They�ll head straight for dandelion, Edmunds said, which are in good supply in spring. Since mason bees travel only short distances, about 200 to 300 feet, their favorite plants need to be planted near nesting spots or away they�ll go. You�ll also need to provide small patches of clay mud, something in abundance in the Willamette Valley. But if you�ve covered your soil with mulch, it�s a good idea to push away a little bit to create a mud pool for them. If the soil dries out, give it a misting. Alternately, put a tray out and fill it with moist clay soil. The female mason bees use the clay soil to wall up their eggs, which are deposited in the tubes or crevices with nectar and pollen they�ve rolled into little balls, Edmunds explained. They�ll continue to alternate wall, food, egg and wall until they come to the end of the tube or crevice and then close it up for the next nine months. The eggs develop into small larva that spin cocoons where the adults form. Come spring, the adults break through the cocoon, chew through the clay and fly out to start the process again. In their short life, these single-minded bees do an important job for gardeners. Most significantly they efficiently pollinate prized fruit trees, giving a markedly increased yield. But consider a more altruistic reason, Edmunds said. Mason bees, like other beneficial insects, help diversify the garden, leading to a healthier backyard ecosystem, healthier humans and a healthier planet. The Oregon State University Extension Service shares research-based knowledge with people and communities in Oregon�s 36 counties. OSU Extension addresses issues that matter to urban and rural Oregonians. OSU Extension�s partnerships and programs contribute to a healthy, prosperous and sustainable future for Oregon.